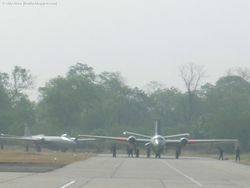 Photos by Shiv Aroor [url]http://livefist.blogspot.com[/url] -------------------------------------------------- PIB Press Release The Indian Air Force today phased out its Canberra aircraft after fifty years of its glorious service. 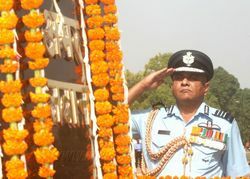 The phasing out ceremony was held at Air Force Station Agra and was presided over by the Chief of Air Staff, Air Chief Mshl FH Major. 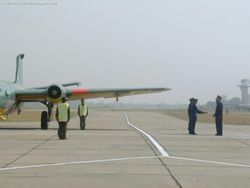 The ceremony comprised the fly past by the mighty bombers and concluded with the handing over of form 700 to the Chief by Wg Cdr Mathur, the CO of Canberra Squadron. 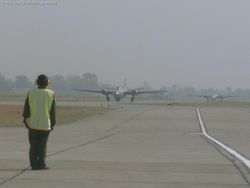 For over fifty years, the Canberra has been a familiar sight the world over, both in war and peace. Designed in 1944 to meet a specification for a jet bomber, the Canberra has had an unrivalled history in the world of military aviation. 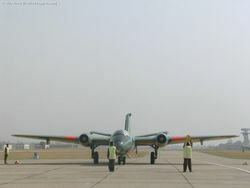 During its lifetime the Canberra equipped over sixty RAF squadrons plus a number of special flights. 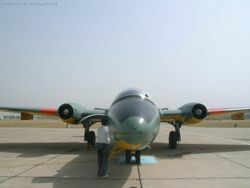 It was license built both in Australia and the USA, in the latter as the B-57, some 400 odd were built. 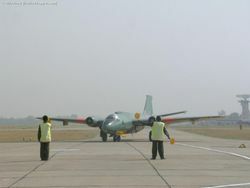 It also proved a best seller overseas, being operated by seventeen air forces, and seeing active service with many of them. No. 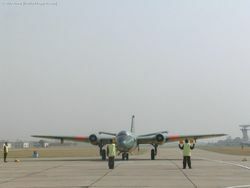 5 squadron IAF was the first to equip with the Canberra Bomber in May 1957, and by 1959 two more squadrons, No 16 and 35, had become operational on type. 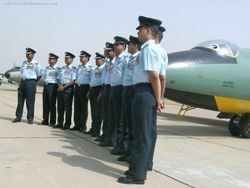 The eight PR-57s were operated by 106 SR Squadron, while the T-54s were formed into a jet bomber Operational conversion Unit, namely JBCU. 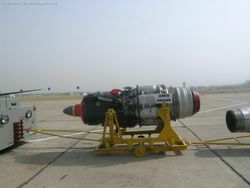 The Canberras were mostly based at Agra. 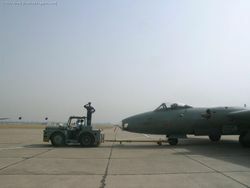 Target- towing version was added to the inventory of the IAF in 1975. 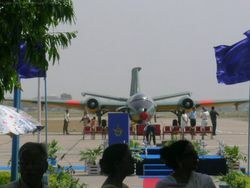 Canberra , the only bomber of the Indian Air Force untill late seventies, came to India in 1957. 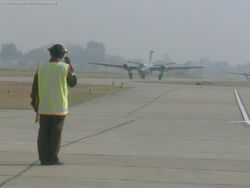 An aircraft of British origin, the twin-engine jet bomber has been a proud possession of the Indian Air Force. 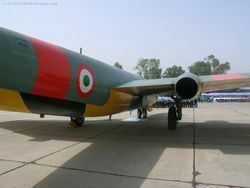 The high altitude bomber was a force to reckon with in the then prevailing war scenario in the Indian subcontinent. Cruising at four-fifth the speed of sound at 40,000 feet, Canberra was the right weapon carrier then, to carry the war well beyond the frontiers, deep into enemys territory. 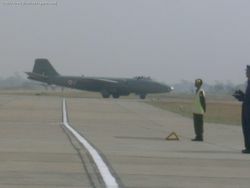 Canberra got the first taste of operation on 18th December 1961 when 16 Squadron and 35 squadron were tasked to carry out reconnaissance and bombing of Dabolim airfield. Canberras of No. 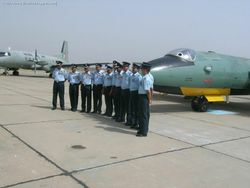 35 Squadron were the first jet aircraft of the IAF to bear its arsenal on an enemy. 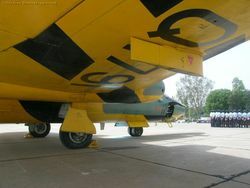 On 18 Dec 1961 the squadron dropped 60,000 lbs bombs over Dabolim airfield against the Portuguese. 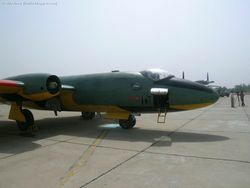 It is worth mentioning that the highly accurate bombing damaged only the target with no civilian causalities and the ATC and the aircraft on the dispersal were deliberately not targeted. By the 20th Goa had been reclaimed. The Belgian Congo broke out in political turmoil in 1961 and the UNO was called in for help. 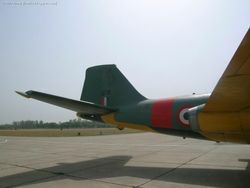 When the situation in Katanga (UHHQ) and the capital Leopoldville worsened, India was requested to send strike aircraft on behalf of United Nations. Earmarked for this task was the proud No. 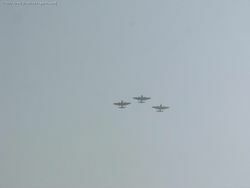 5 squadron. 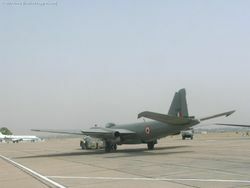 On October 9th 1961, under the command of Wg Cdr A Suares with twelve aircrew and ninety support personnel, six Canberra aircraft took off from Agra for Ndjili airport, Leopoldville over 6000 km away via Jamnagar and Nairobi as the first ever Indian Fighter bomber contingent to take part in UN operations. The Canberras were a major contributor towards the UN aim of establishing peace in Congo. 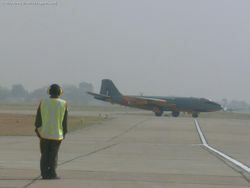 Through the Canberras stood down in the Chinese conflict and did not fly any combat sorties, recce sorties till went through. 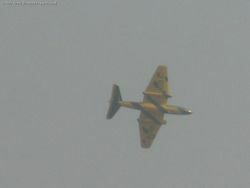 The Canberras flew 22 Photo Recce missions between 13 Oct to 11 Nov 1962 totaling more than fifty hours. 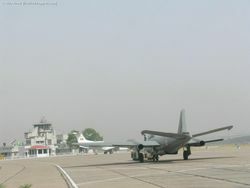 Areas of Aksai chin and Eastern sector were covered to monitor enemy encroachment. 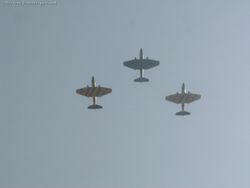 The Canberras performed magnificently in the conflict. 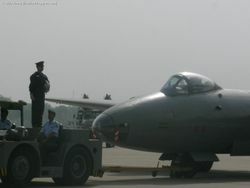 Canberra s mettle was tested for the first time in 1965 Indo-Pak war. 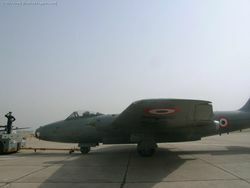 Numerous high level bombing missions were successfully flown during the course of the short war. 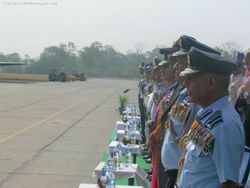 In recognition of their bravery and valour many Canberra crew, were awarded Maha Vir Chakras, Vir Chakras and other gallantry awards. 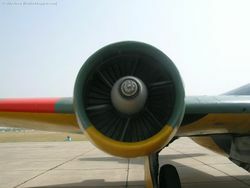 Battle scenario changed dramatically for Canberra bombers after the 1965 war, Entry of radars and high performance fighters with night combat capability meant curtains for the high level sub-sonic bomber. 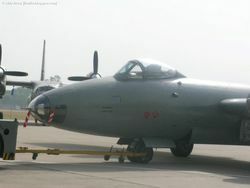 However, air space close to the ground was still a grey area for the radars and the fighters and this was well exploited by the Canberra . 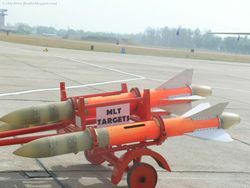 Canberras were soon zooming at high speeds across the Gangetic Plains, the lush green fields of Punjab and Haryana, the sandy deserts of Rajasthan, the marshy lands of Saurashtra and the cool waters of the Arabian Sea, honing the new techniques for low level penetration and pull up attacks. 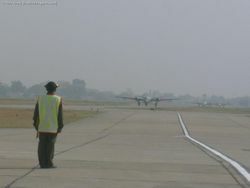 The cohesive teamwork of skillful pilots and meticulous diligent navigators kept Canberra a viable and dependable bomber force when the 1971 war broke out. 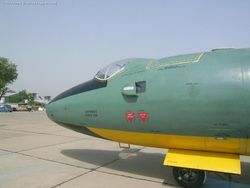 It goes to the credit of scores of aircrew and hundreds of ground crew that within hours of Pakistani pre-emptive strike in 1971, Canberra spearheaded a strong counter-attack on a number of Pakistani targets. 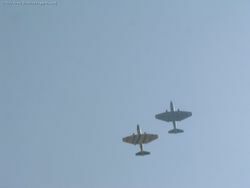 Throughout the war, Canberra gave enemy no respite even at night due to persistent night raids on numerous targets. 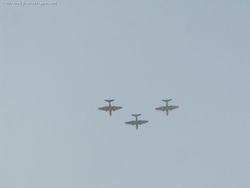 The highlight of the 1971 operations was bombing attacks carried over the Oil Refinery complex at Karachi. The results of these raids were so devastating that the Karachi Oil complex was ablaze for nearly a week. 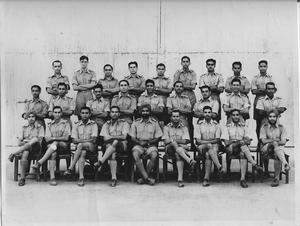 Canberra Squadrons were richly rewarded with four MVCs, a dozen VCs and many other gallantry awards and distinguished service awards in recognition of their contribution to the 1971 war. 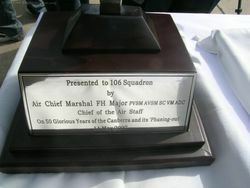 Canberra had justified the faith reposed in them at the time of their acquisition in 1958. 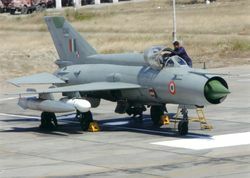 Advent of potent air defence system consisting of low looking radars, surface to air missiles and supersonic fighters equipped with air to air missiles in late seventies signaled formal retirement of this great war-horse from combat duties. However, superb aerodynamic design, high system reliability and good maintainability gave Canberra a lease of life to march on for some more time, albeit, in secondary roles viz. 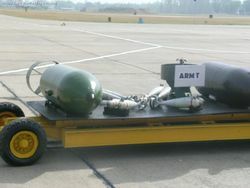 electronic warfare, maritime strike and target towing. 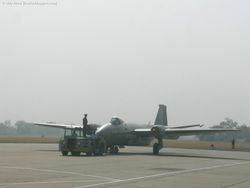 The Photo Reece Canberra continued to operate stealthily for some more time. 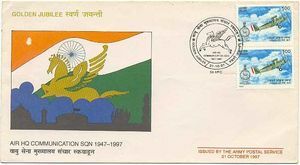 It was effectively used in the Kargil conflict and brought the first photographic proof of enemy intrusion in our territory. 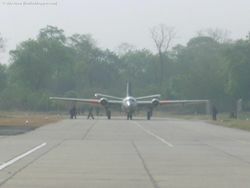 Despite taking a missile hit, the aircraft managed to land back safely at a nearby base. 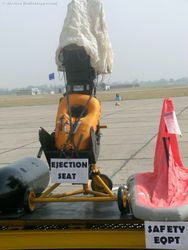 Such indeed was the reliability of the aircraft and the courage and commitment of its crew. 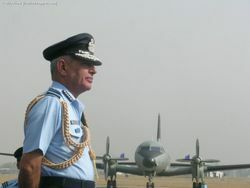 After having served the nation for 50 years, the stubborn fighter was bid adieu today i.e, on 11 May 07.